Occupying the most northern range of the U.S, the Eastern Wild Turkey can grow to be among the largest of all the turkey subspecies. The breeding season in New York usually begins around March or April and can lasts into early June. During this time a "Tom" will mate with many hens. After mating hens begin their nesting period where they will lay 10-12 eggs over as many days in a loosely made nest. After a 28 day incubation period young wild turkeys called "poults" are born. It will take the poults about a year before becoming a young adult turkey. 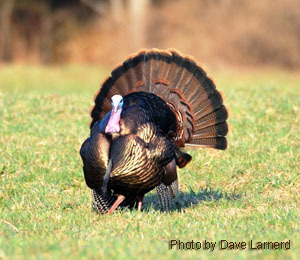 Adult male turkeys have a dark black - brown body and a combination red, white & blue colored head. Their head appears predominantly red when in a none displaying pose, but in full strut the head will take on a snowball like appearance in bright white. They have long hair like feathers commonly refered to as a beard that average between 6 and 12 inches long and leg spurs ranging from 1/2" to 1 1/2" long. Mature gobblers have an average weight of around 18-20 lbs with bigger birds topping the 20 lb mark. Young males, are called "Jakes" and although they are a bit smaller than their adult counterparts, have similar markings. Jakes are easily identified by their immature tail fan with center feathers that protrude higher than the outer feathers. Their beards are usually no longer than about 4 inches, with many birds having no more than what looks like a dry fly sticking from their chest. 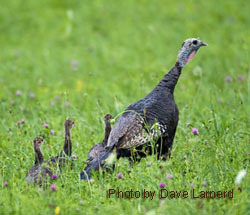 Female wild turkeys are quite a bit smaller than males weighing between 9-12 lbs. Their bodies are more of a rusty brown color and their head is a blue-gray color. Although some hens are known to have beards it is less than 15% that do and less than 1% that develop spurs. Young females in their first Spring are also called "Jenny's". This is a term for young eastern wild turkeys that haven't yet reached their first Spring. Although poults grow quickly, it will take them about two weeks to grow feathers they need to fly high enough to roost with the adult turkeys. Until then they live a dangerous life. It is said that "Everything in the woods wants to eat a turkey", so it is important that a new poult use all of it's natural instincts to survive until they are able to fly high enough to escape predators. Tales from the Turkey Woods: Mornings of My Better Days. Acclaimed nature author and outdoorsman Mike Joyner gives fans Tales from the Turkey Woods: Mornings of My Better Days. The perfect read for outdoor enthusiasts and nature lovers; this collection of spring and fall turkey hunting stories shares the art and timing of what it takes to make the grade. Filled with family, friends, frustrations and fun, this fascinating collection stakes a bold claim on more than a few memorable hunts in the great turkey woods.